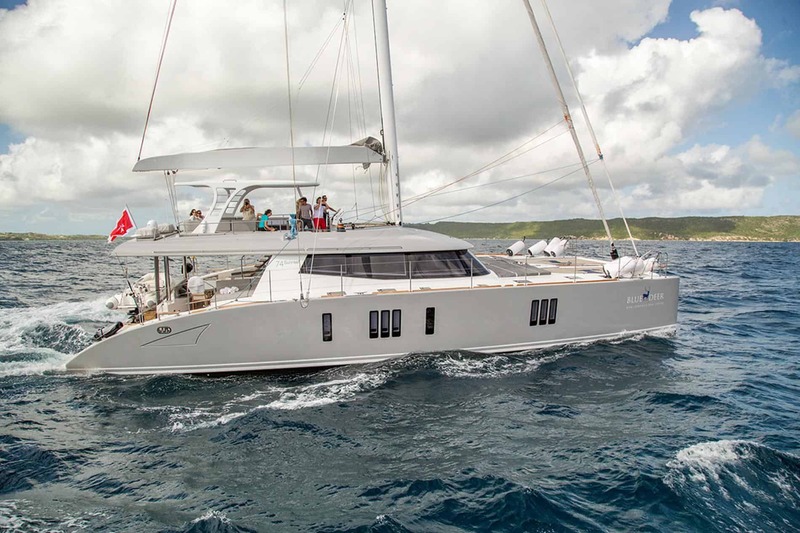 SUNREEF 74 - The best in luxury sailing Sunreef Yachts. 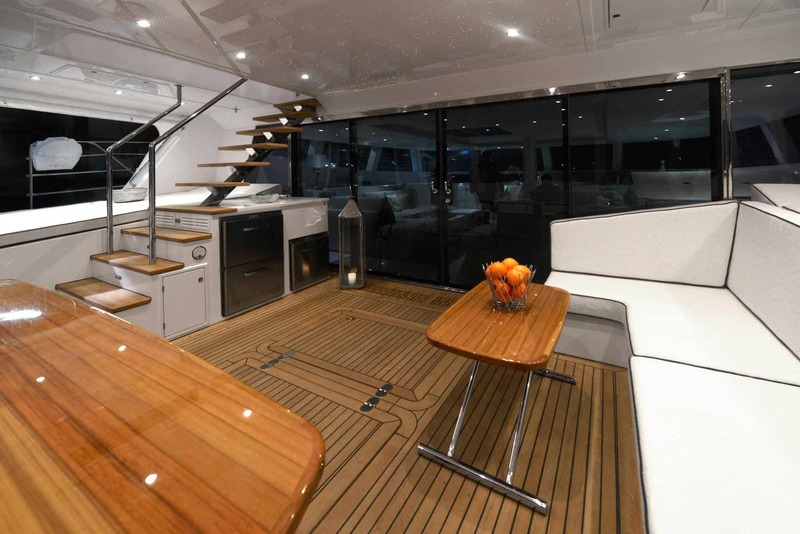 The Sunreef 74 meets the expectations of the most demanding clientele searching for a spacious, long range boat, easily handled by only 2 people. 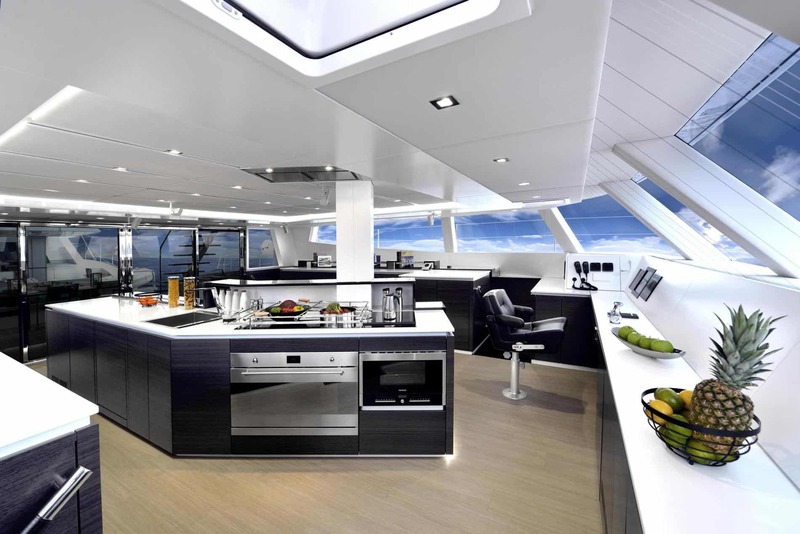 In fact, this advanced model has grown from Sunreef’s experienced design team in the super-yacht range. 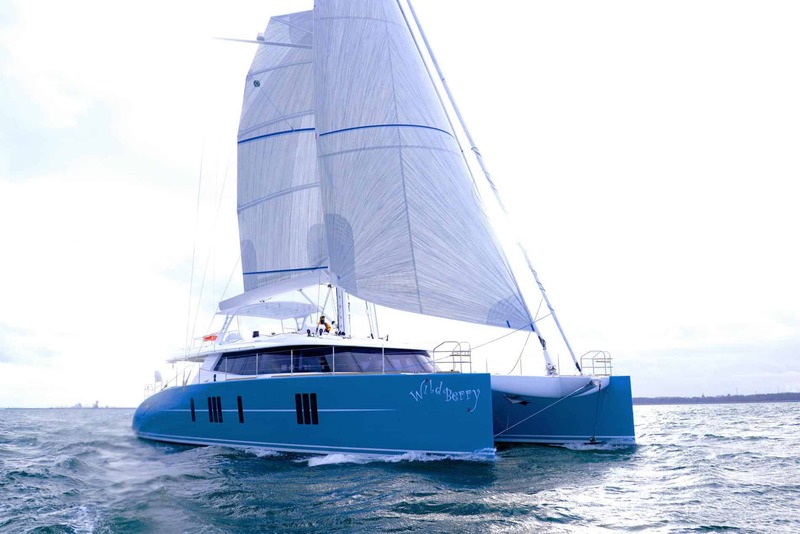 Additionally, in response to feedback from all the 70 Sunreef owners that are sailing all around the world, from Europe to China. 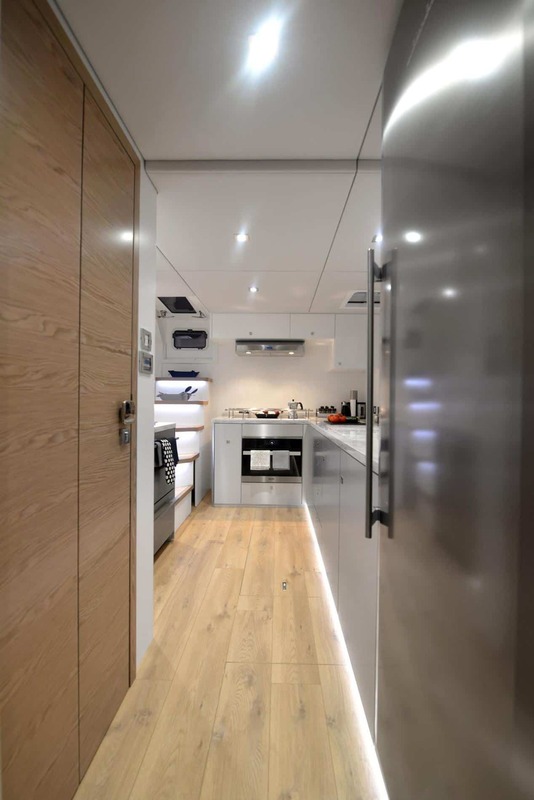 In summary, this unit stands out with its unique, innovative features and new functional solutions enhancing the notion of on-board livability. 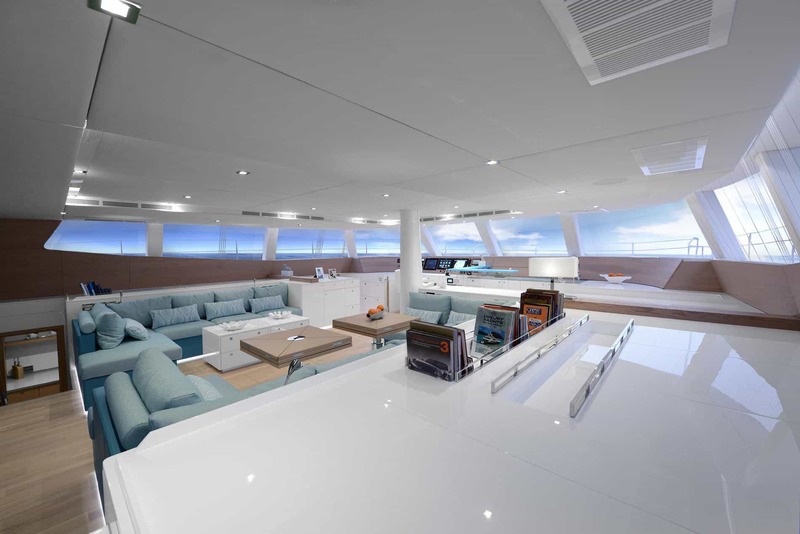 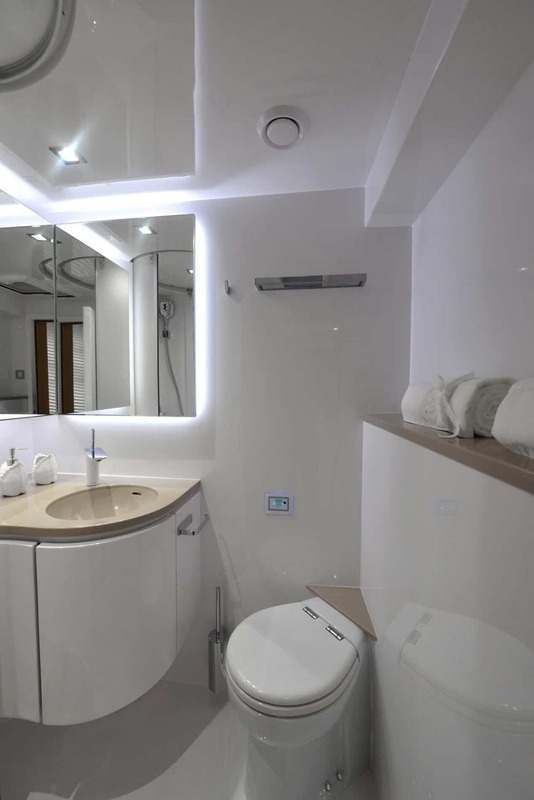 As usual at Sunreef Yachts, the customisation and space arrangement possibilities are unlimited. 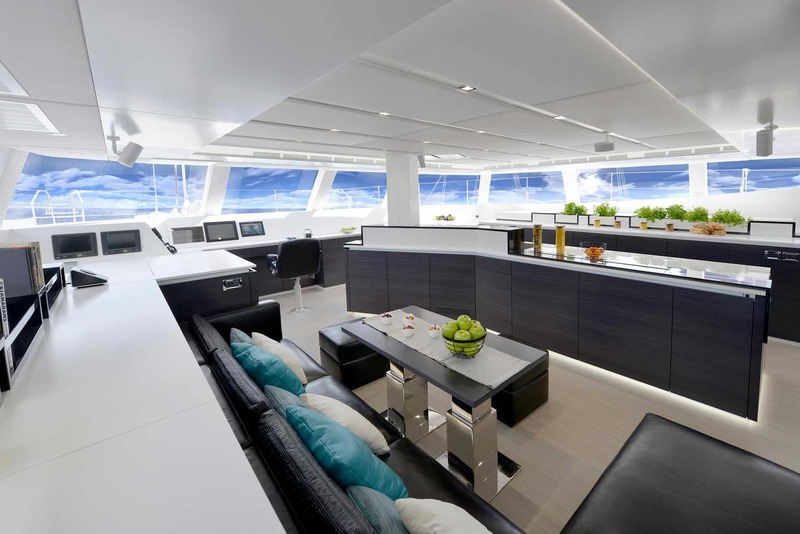 The Sunreef 74 is an optimised yacht offering a perfectly balanced compromise between supreme comfort, performance and advanced technology. 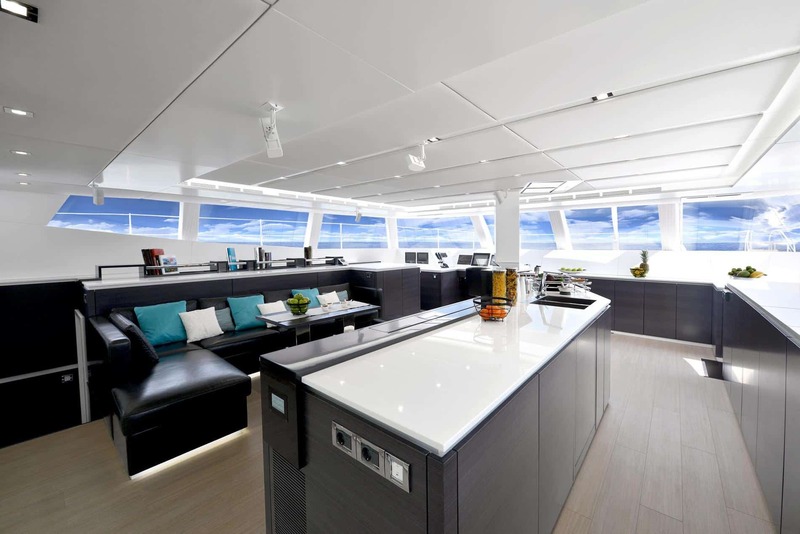 The sleek superstructure with vertical bows and limited free boards has large glass curved windscreens, which highlight the classy lines of this dream yacht. 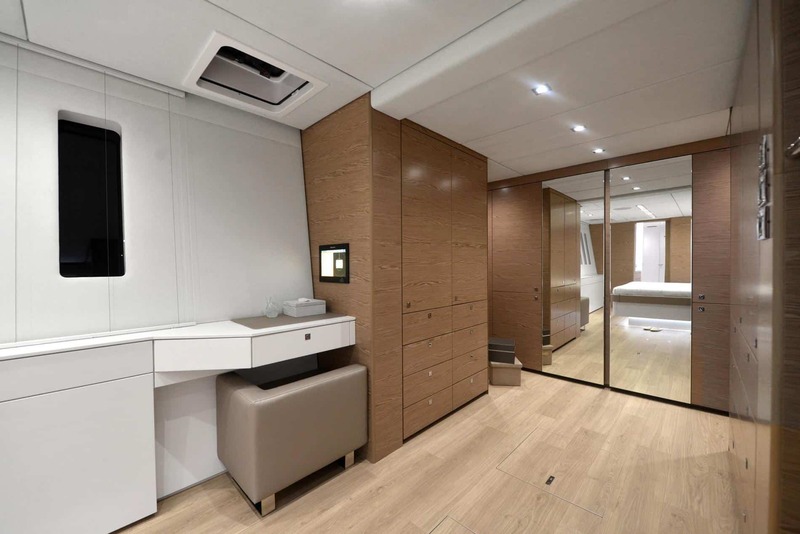 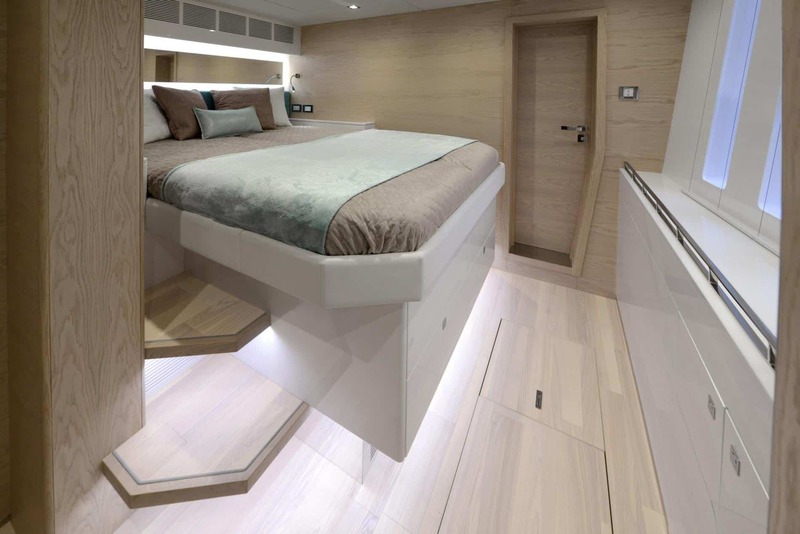 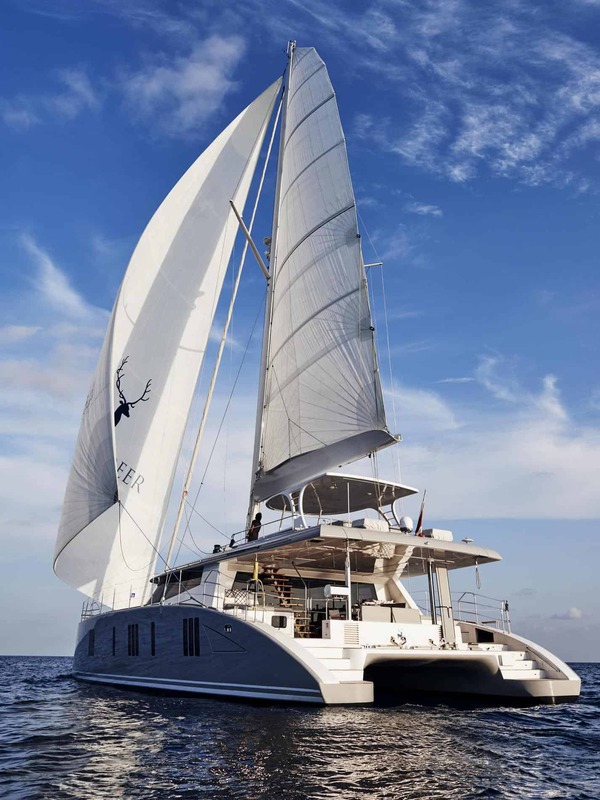 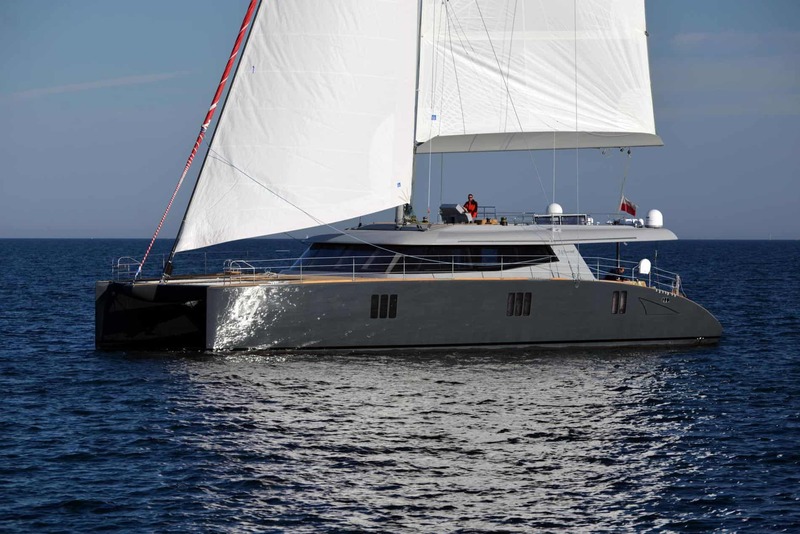 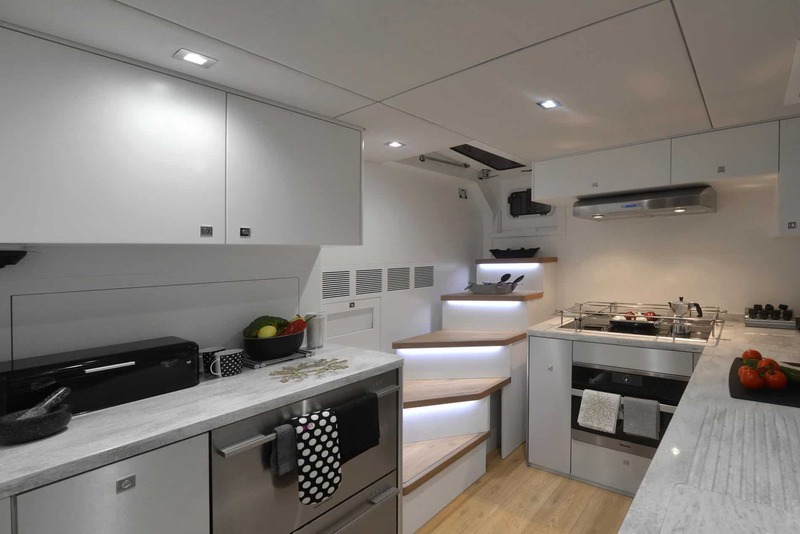 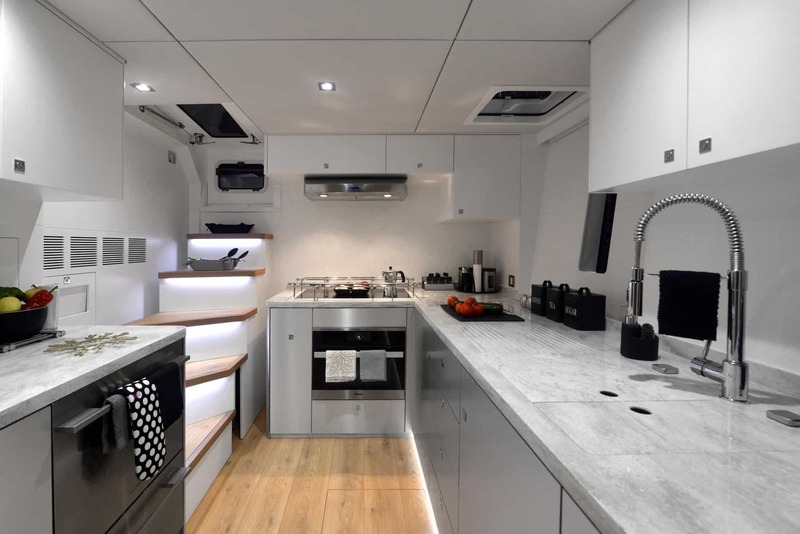 In brief, the Sunreef 74 is an elegant catamaran with super-yacht features, intelligent space planning and a fully personalised interior finish. 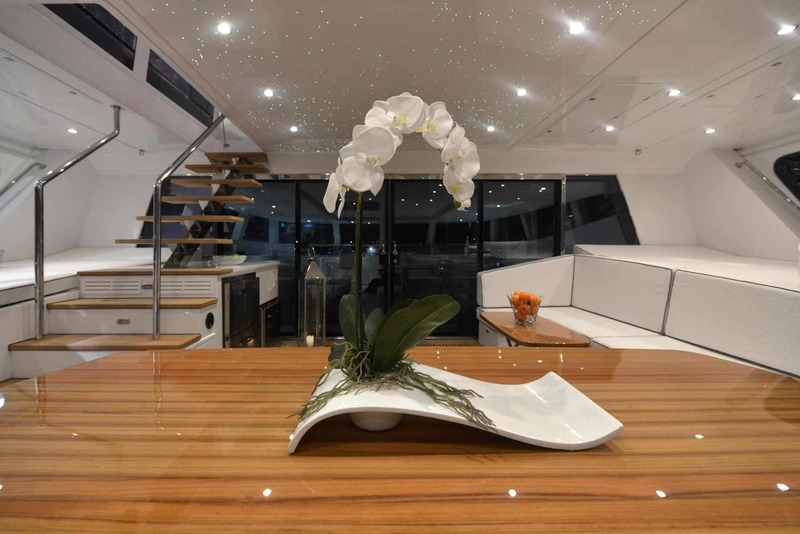 Putting the pleasure of life to the fore, the Sunreef 74 model has reached a supreme level of sophistication offering an impressive 35m² saloon with a breathtaking 360° view. 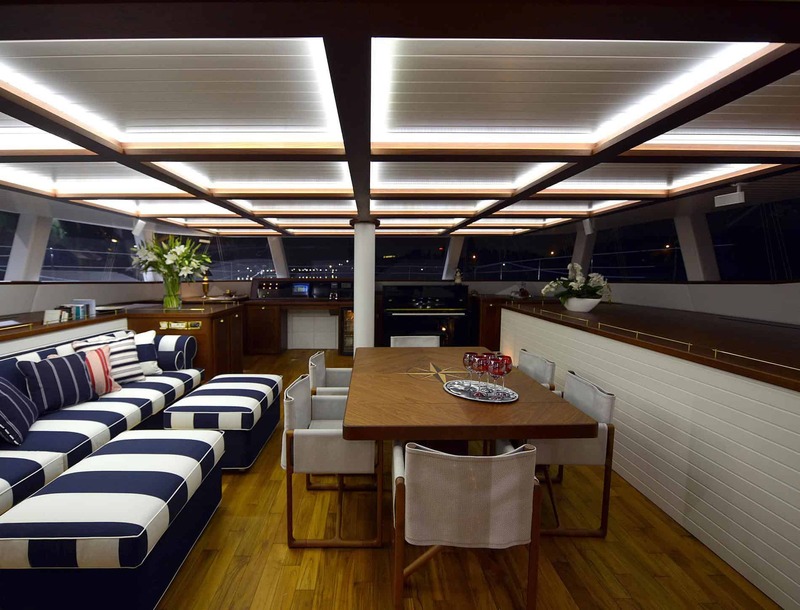 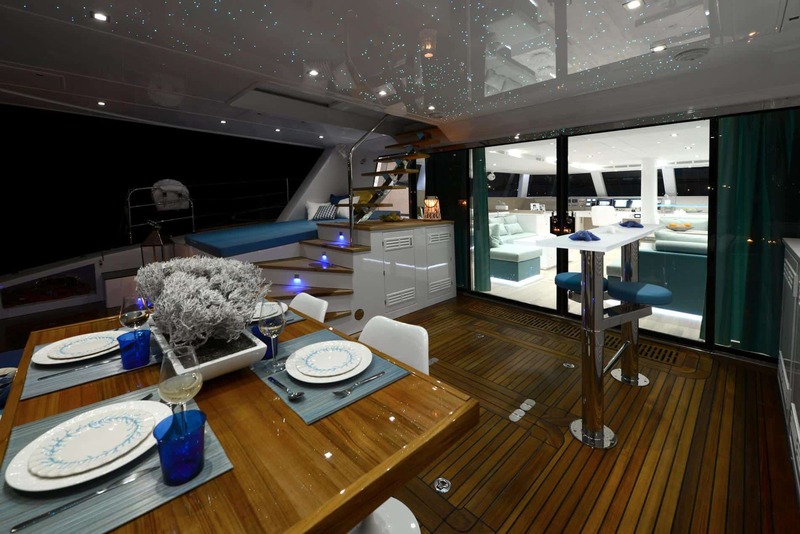 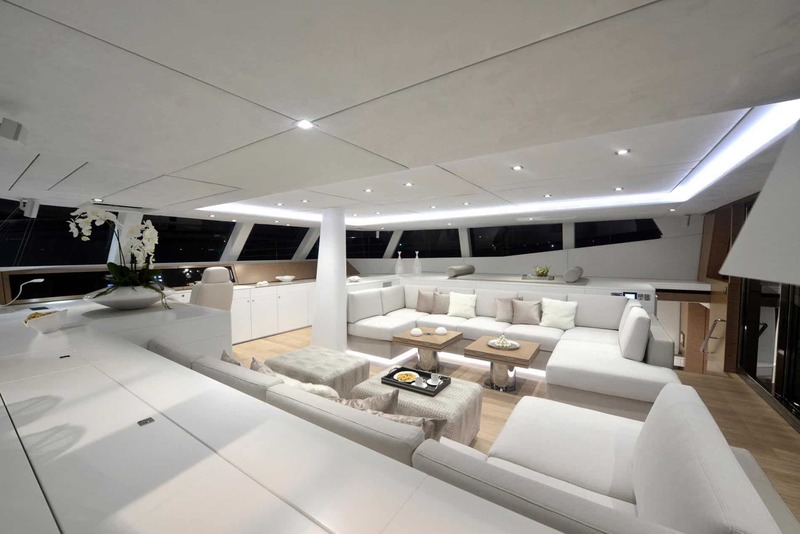 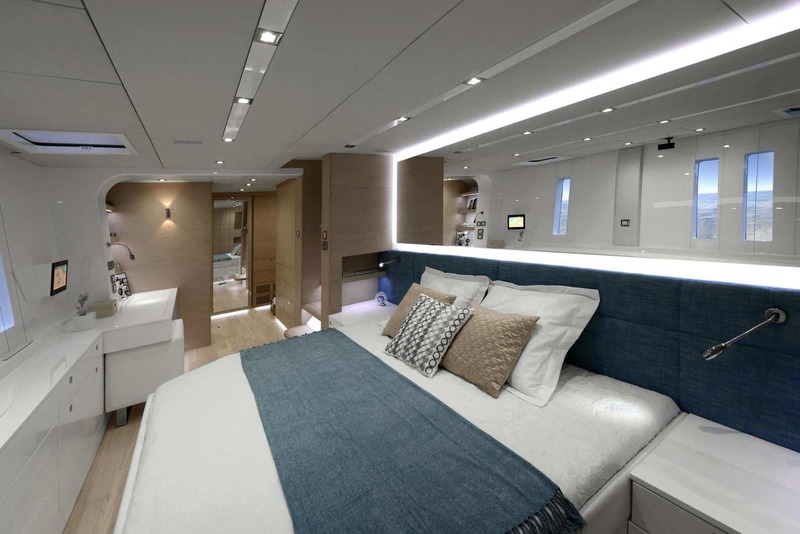 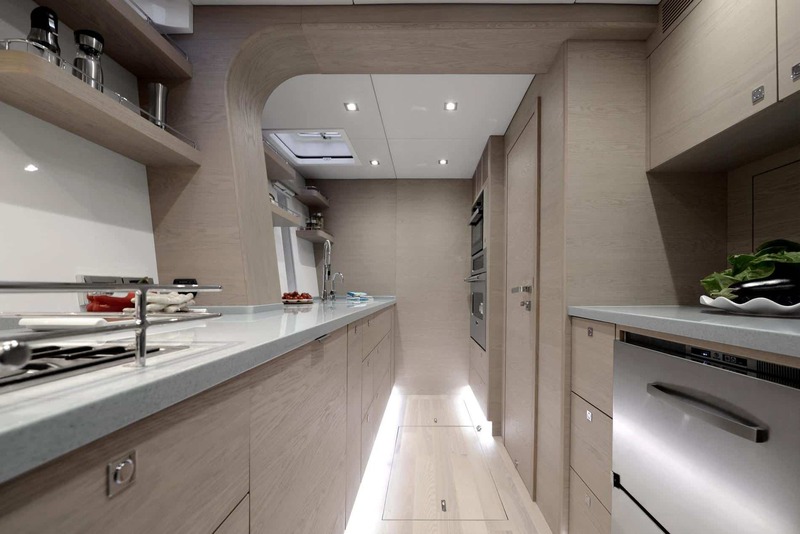 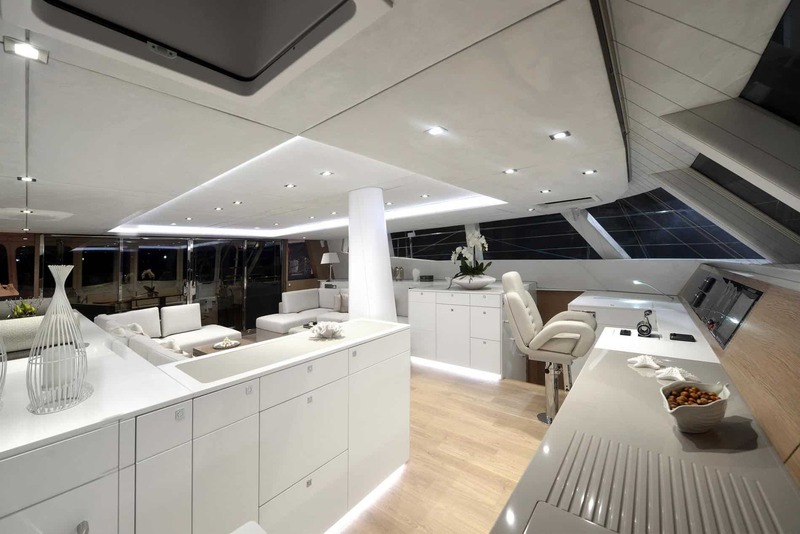 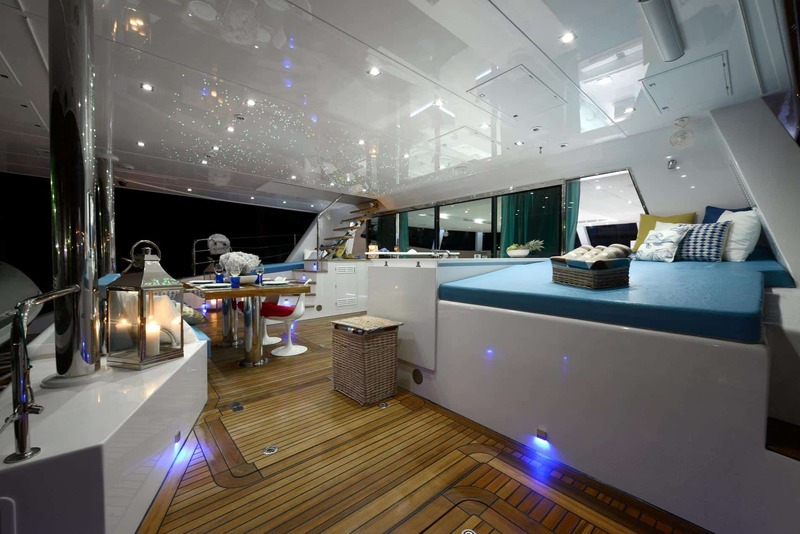 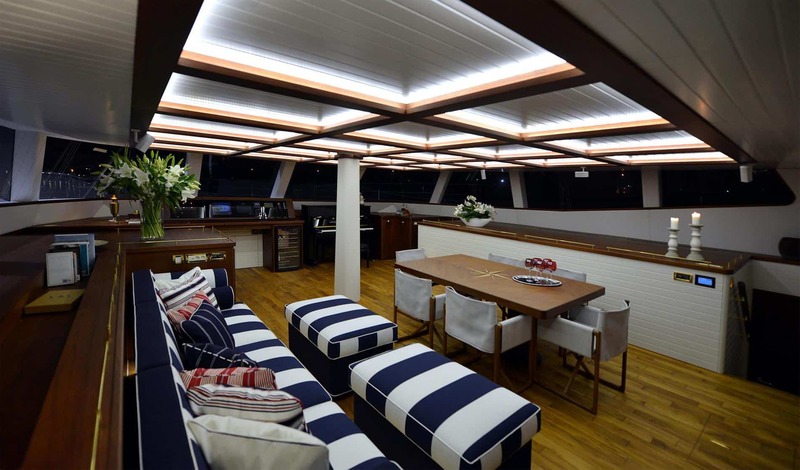 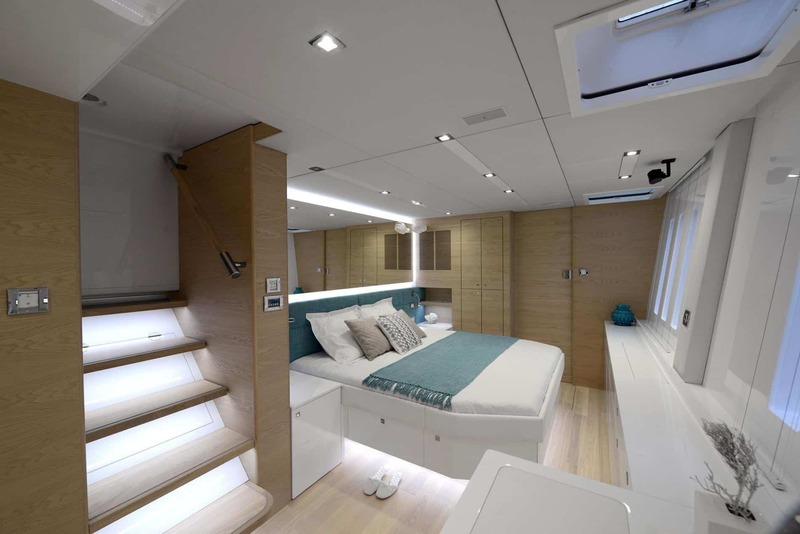 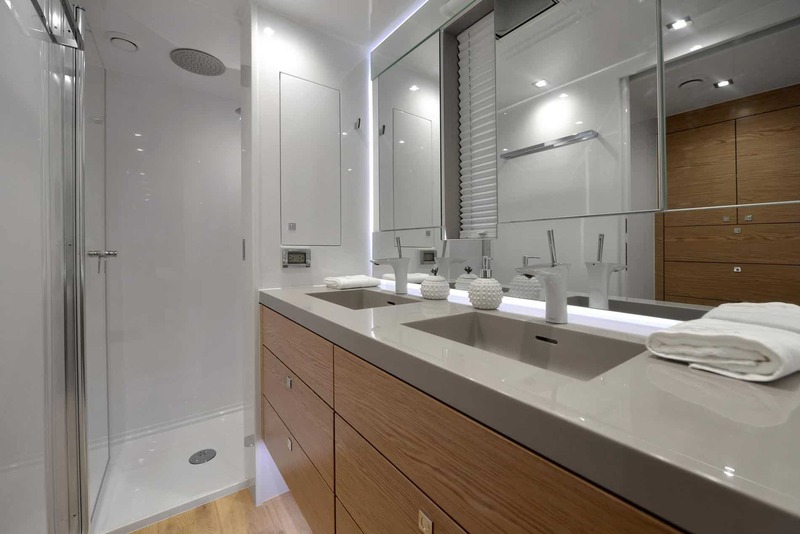 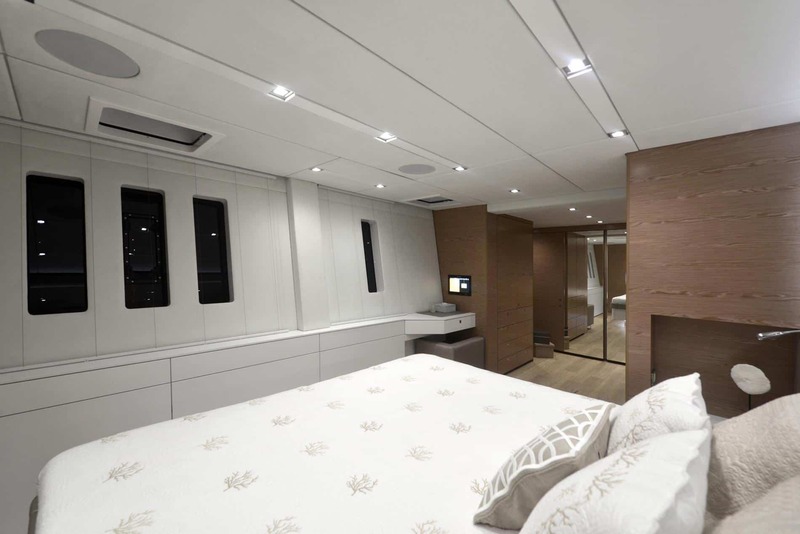 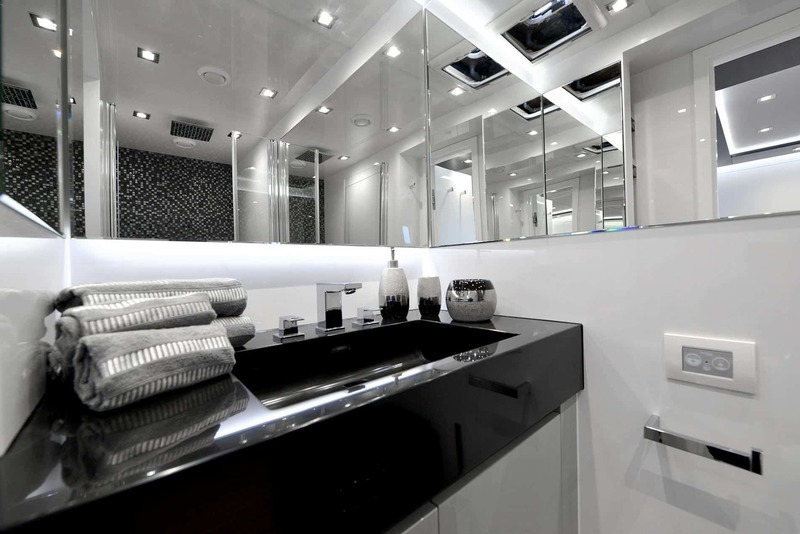 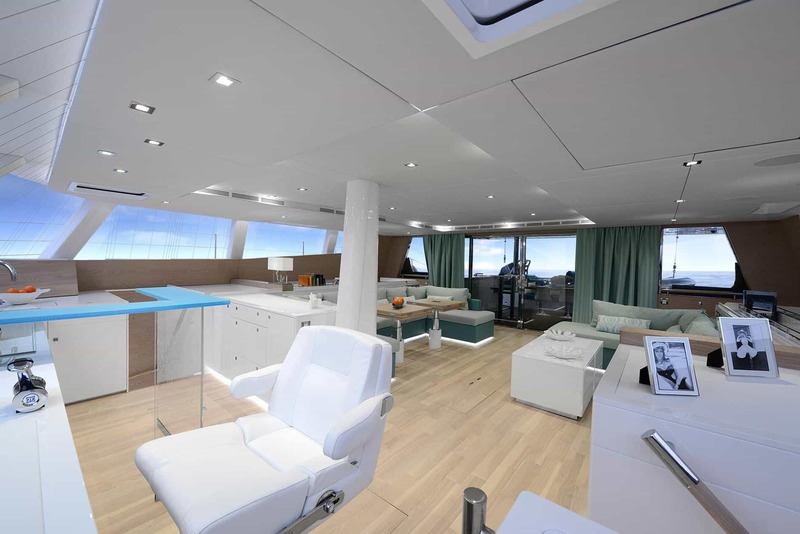 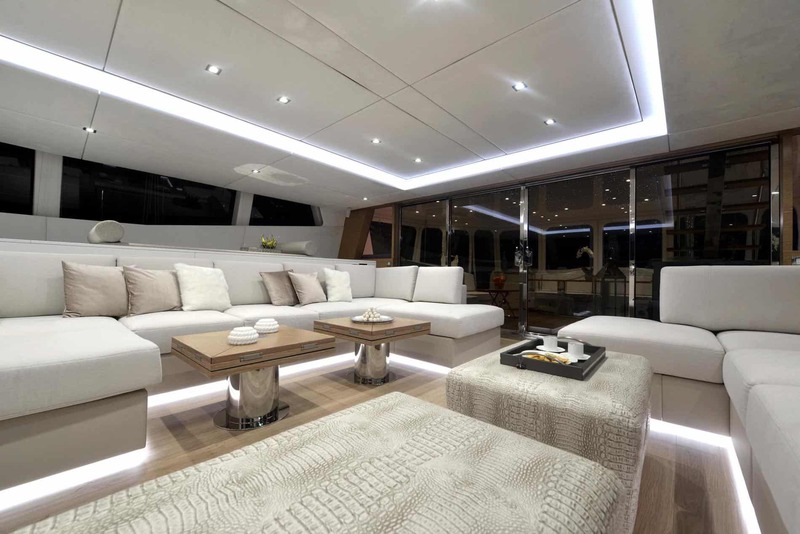 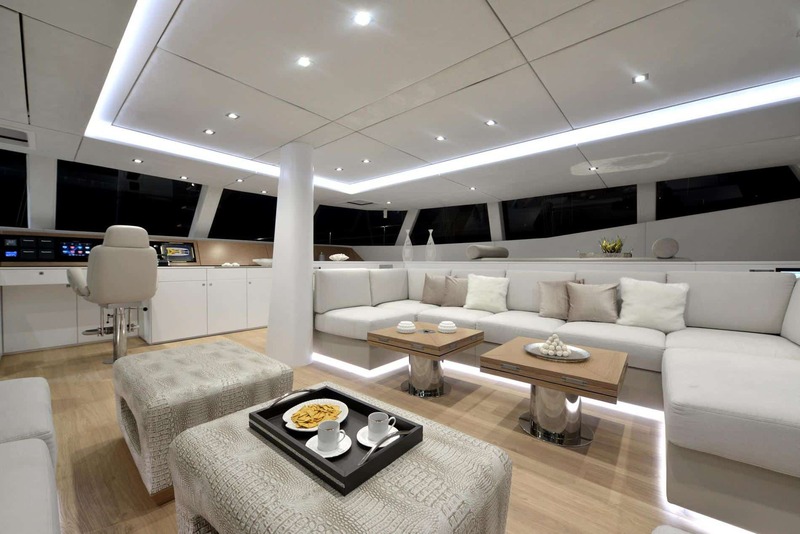 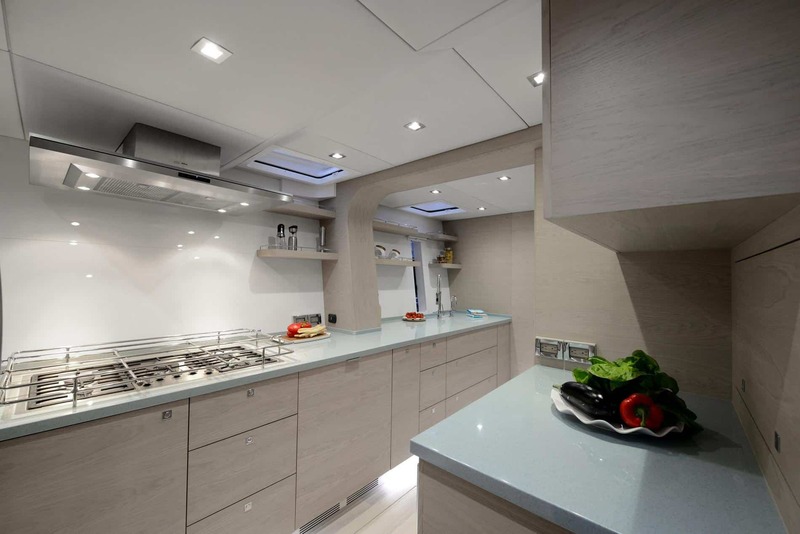 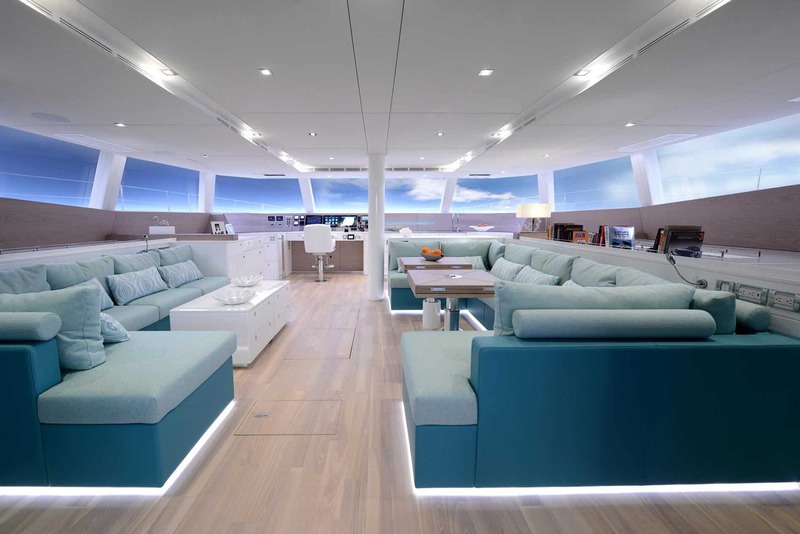 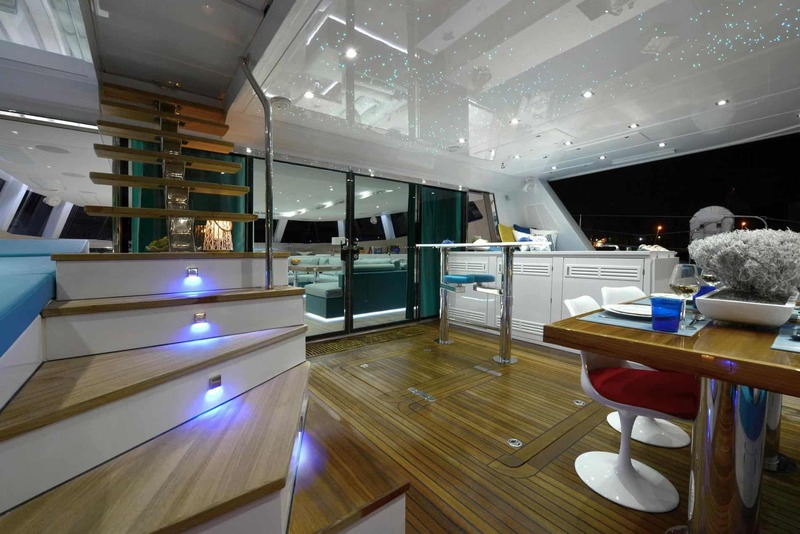 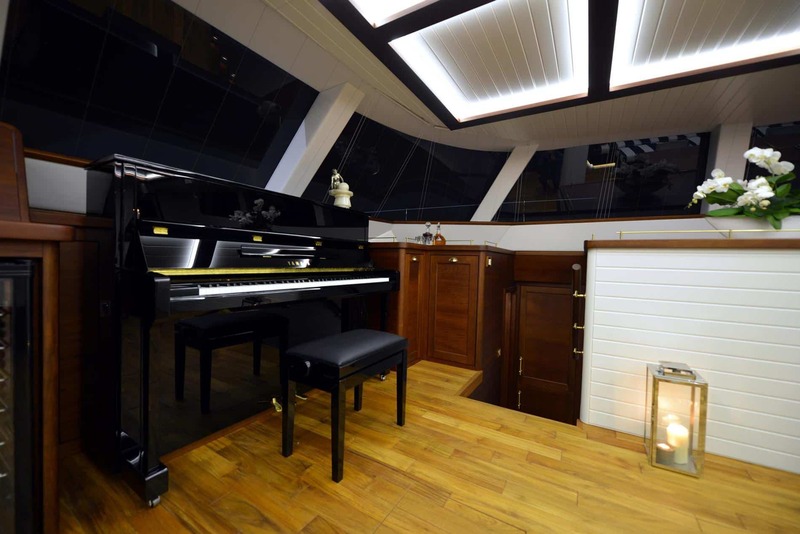 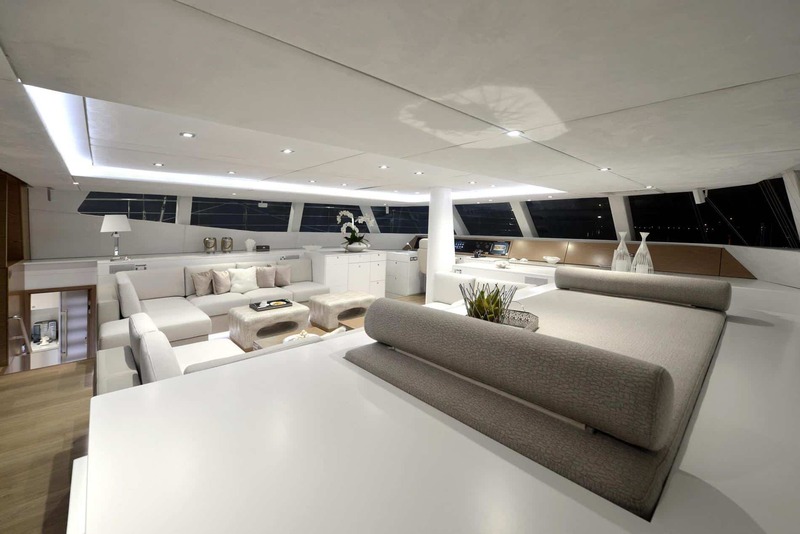 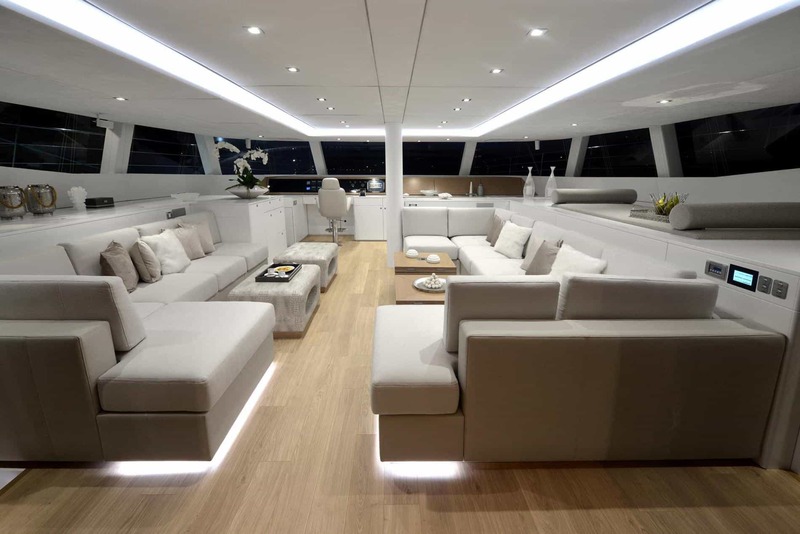 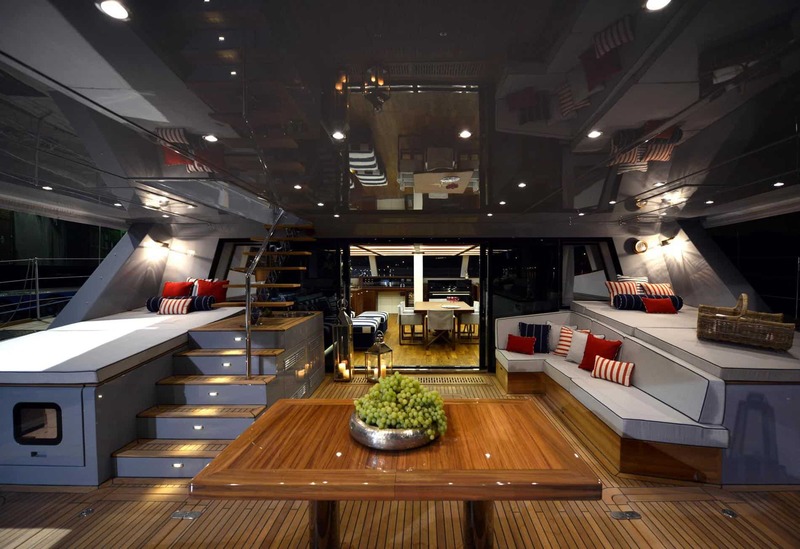 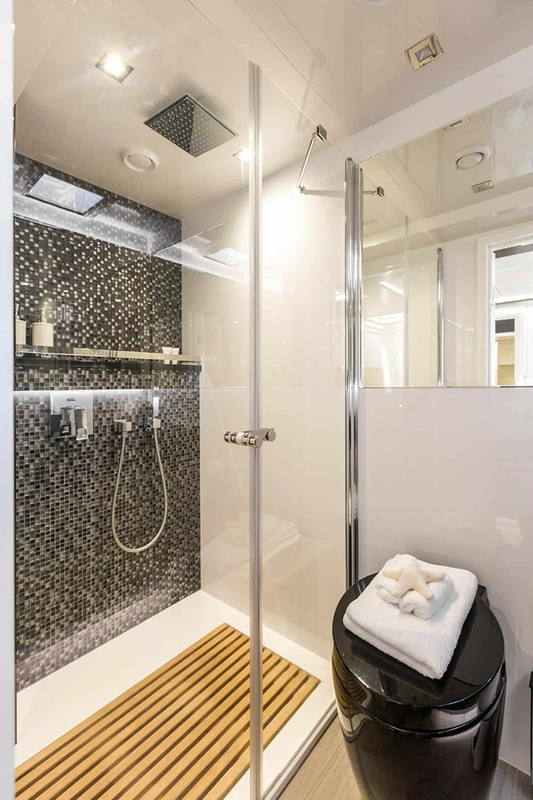 Elegant, modern, with bright interiors, this yacht’s layout is entirely open to customisation. 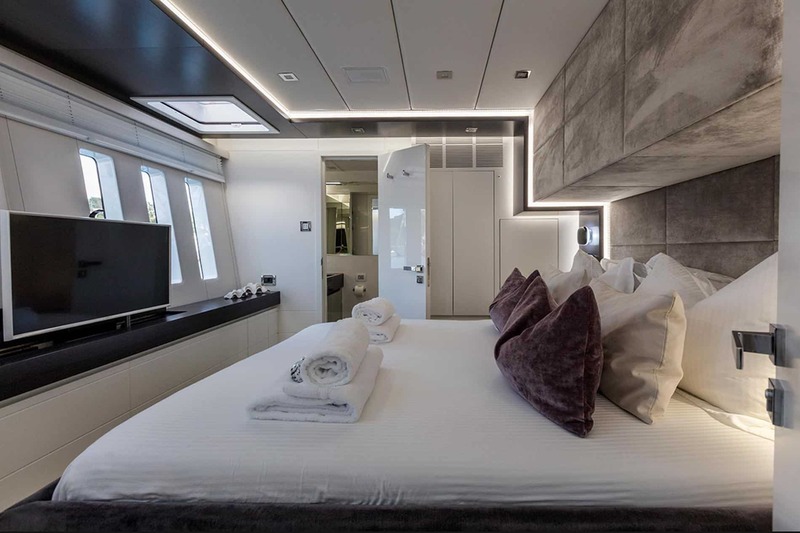 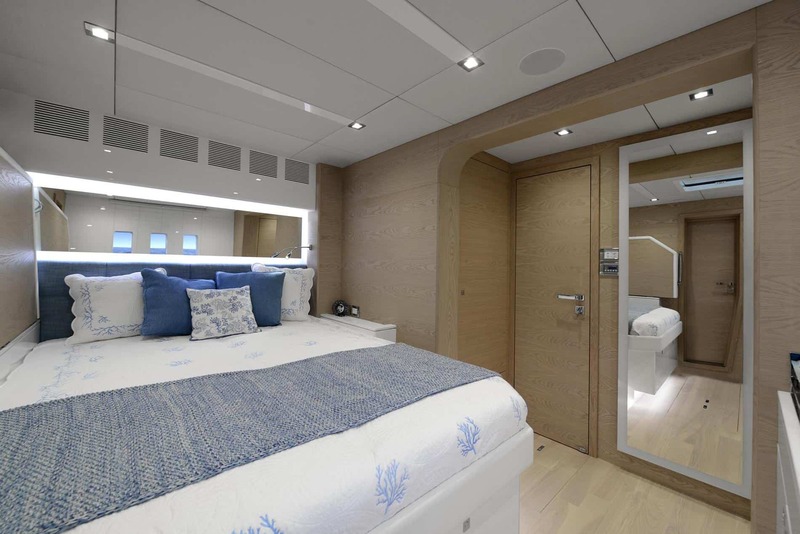 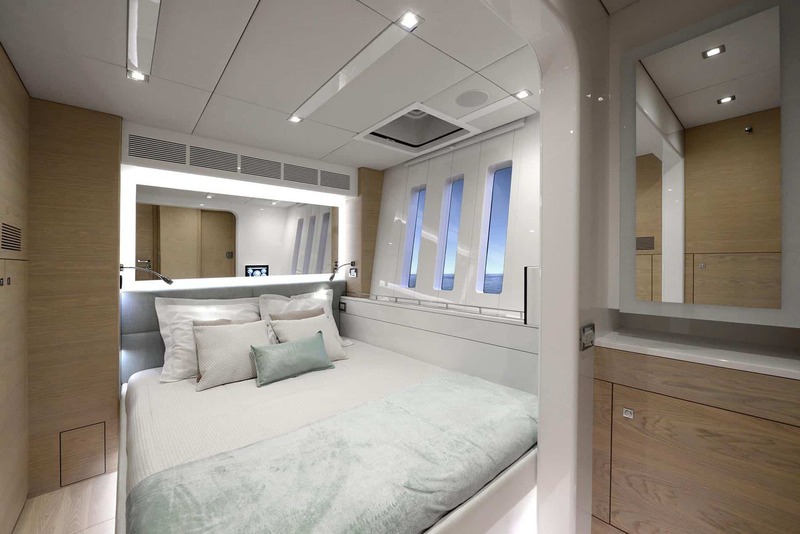 Her hulls are airy enough to contain a bright 20m² master cabin with a king size bed and a bath tub, two 14m² guest cabins, large crew quarters and a fully-equipped 10m² galley. 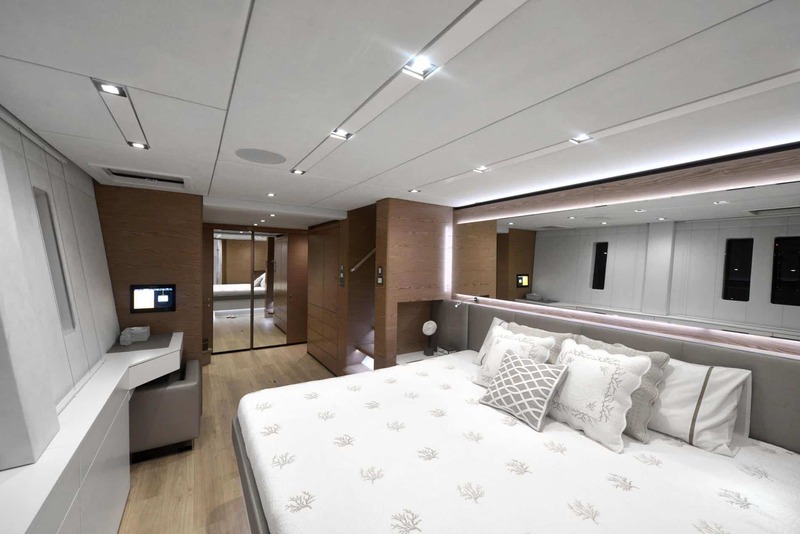 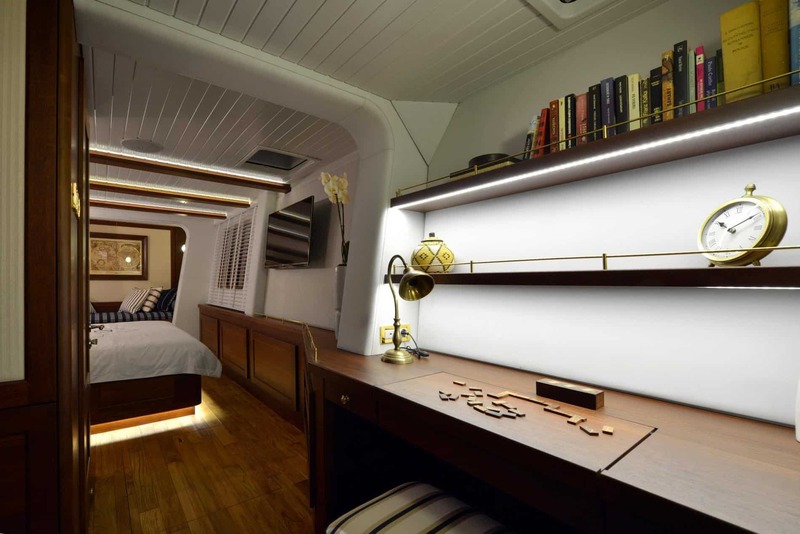 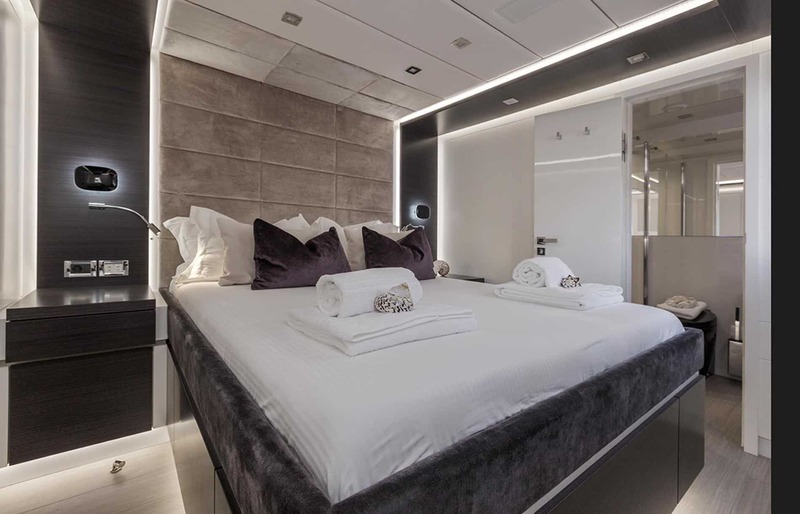 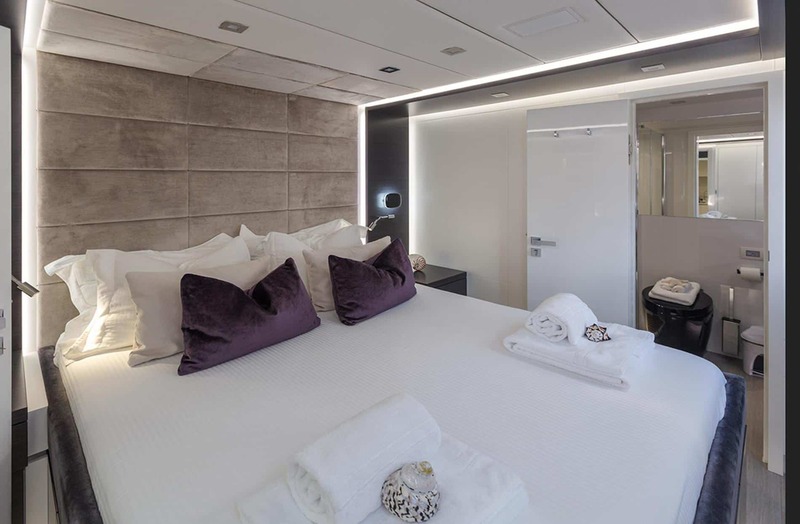 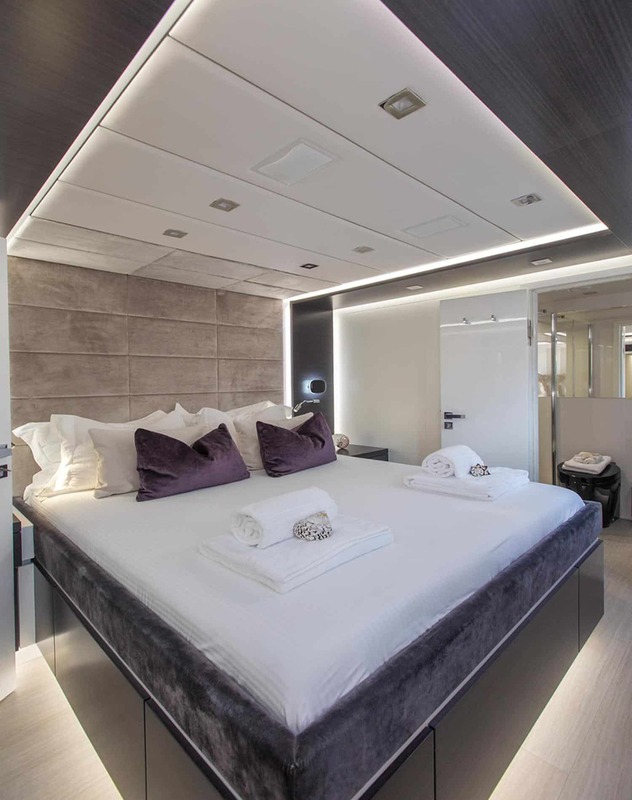 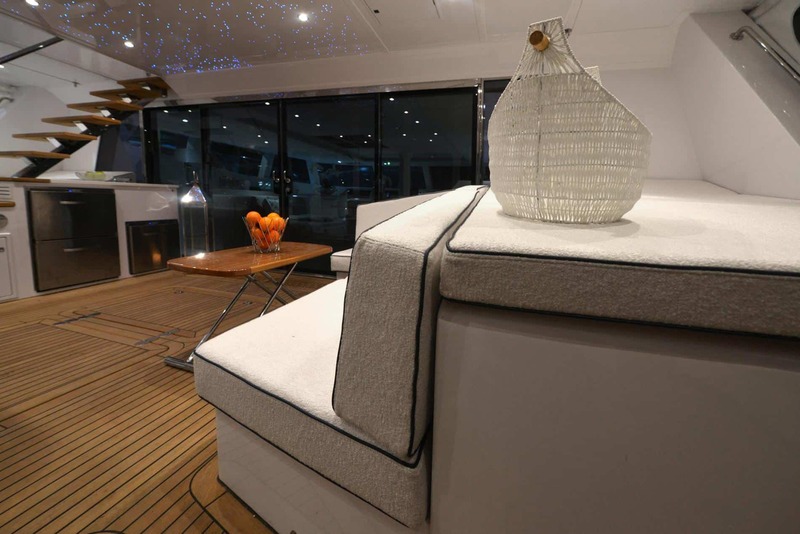 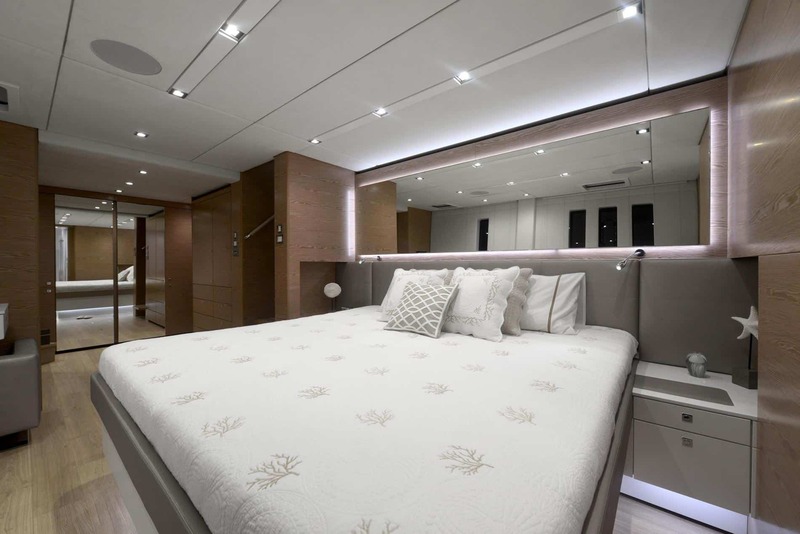 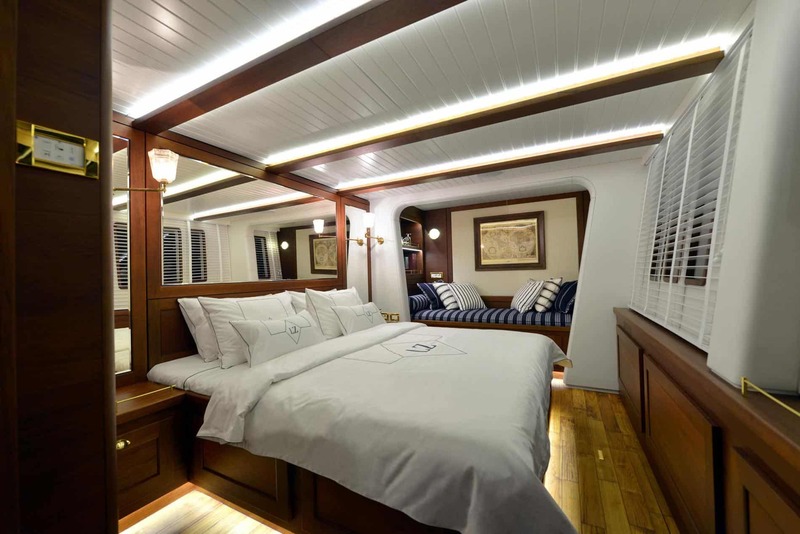 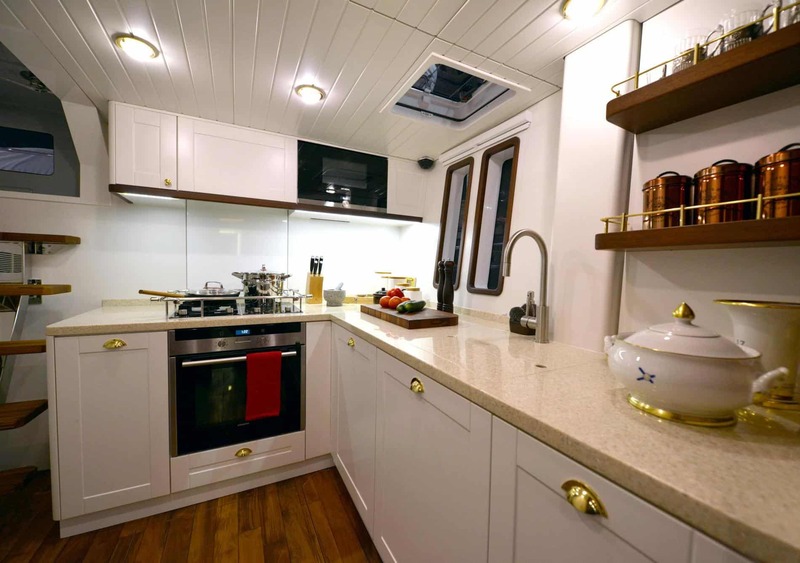 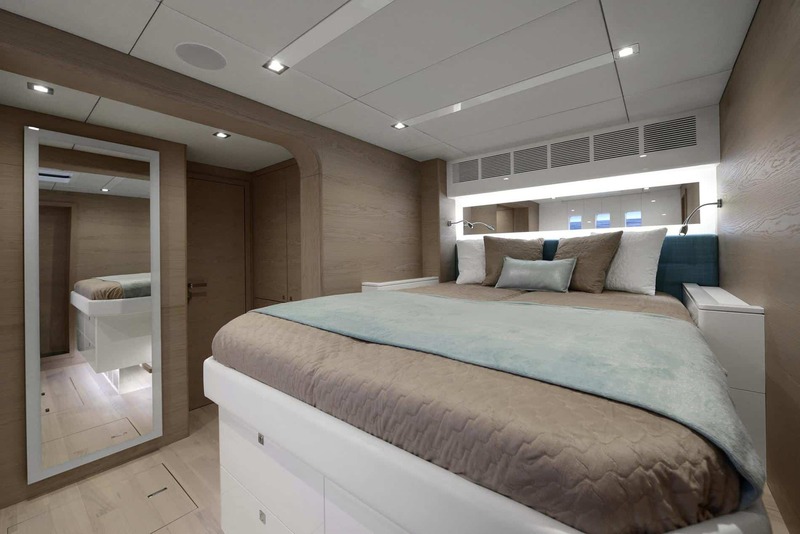 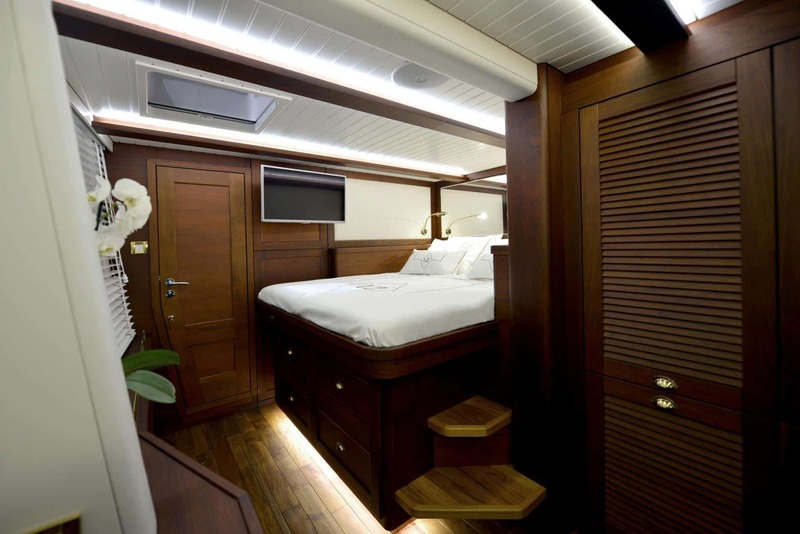 In addition, the Sunreef 74 features huge interior storage space, which makes her perfect for lengthy cruises, requiring additional food and equipment supplies. 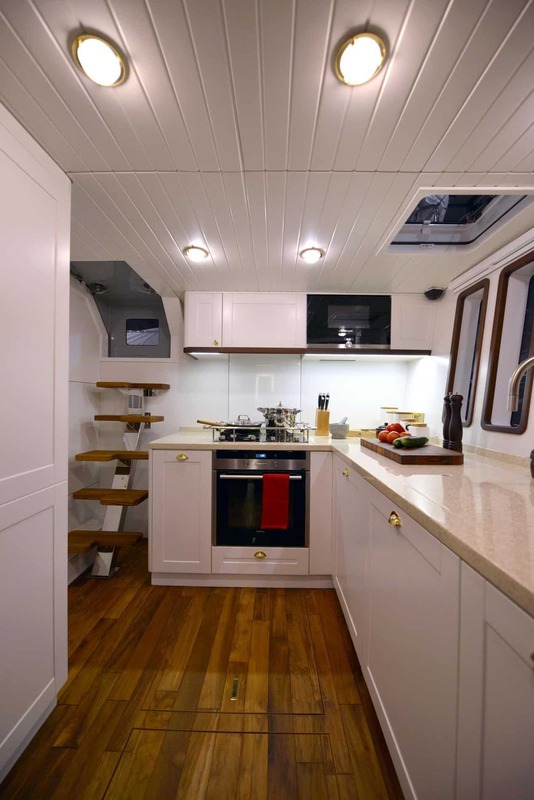 Outside, generous space is also available in the forepeaks and deck lockers for toys, fishing rods, diving gear, sails or fenders. 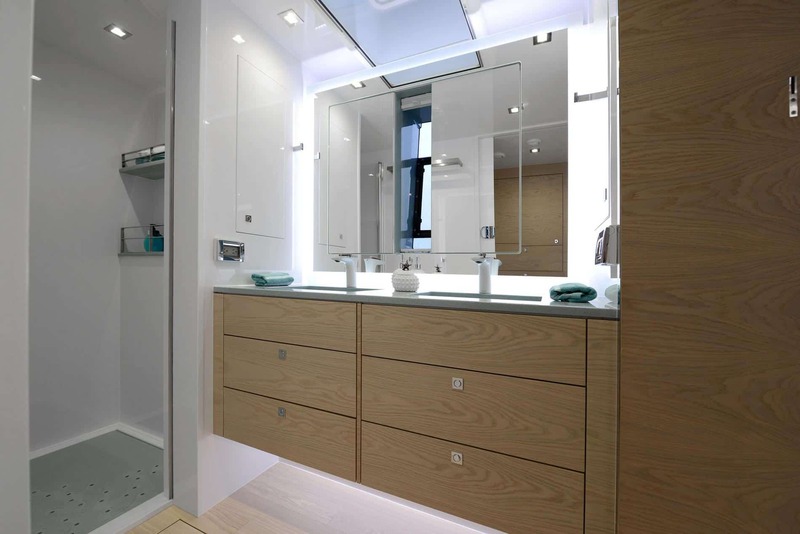 The outside storage also includes an additional locker, big enough to hold kayaks and windsurfing boards. 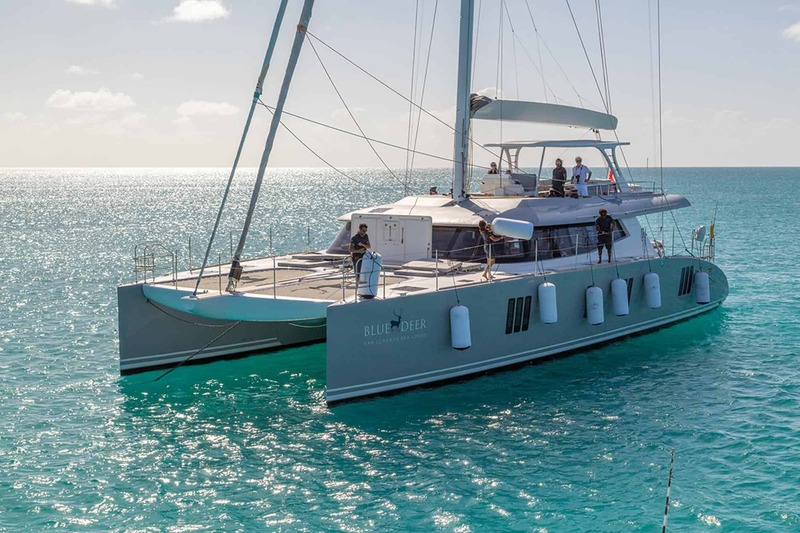 The Sunreef 74 can be comfortably manoeuvered by two people in all offshore conditions, which, for instance, makes her ideal for couples sailing around the word, with little to no crew. 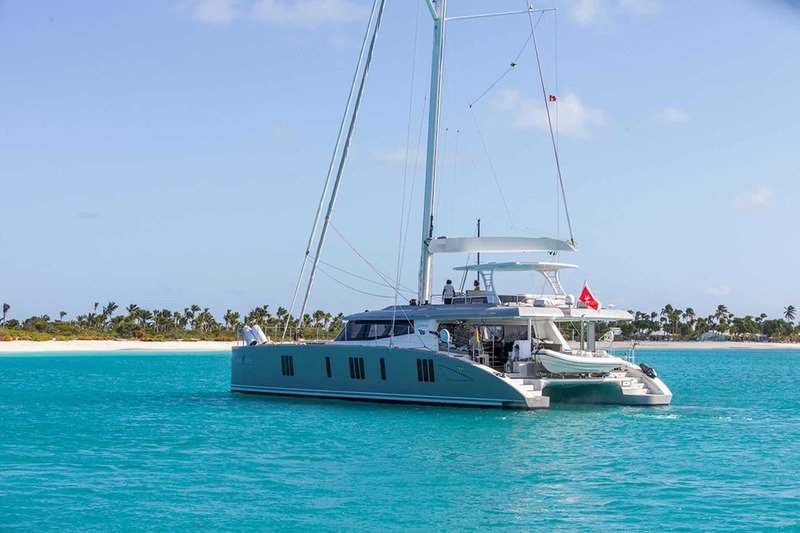 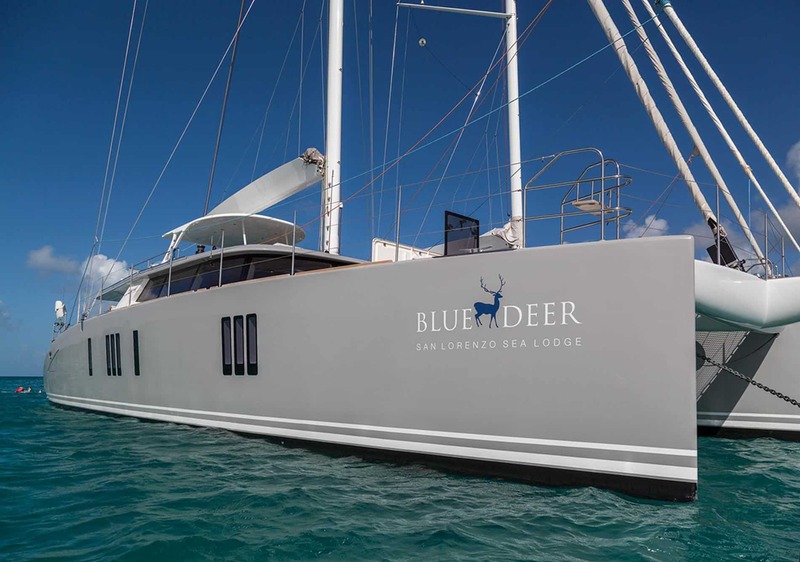 In addition, all sails are handled from the flybridge helm station. 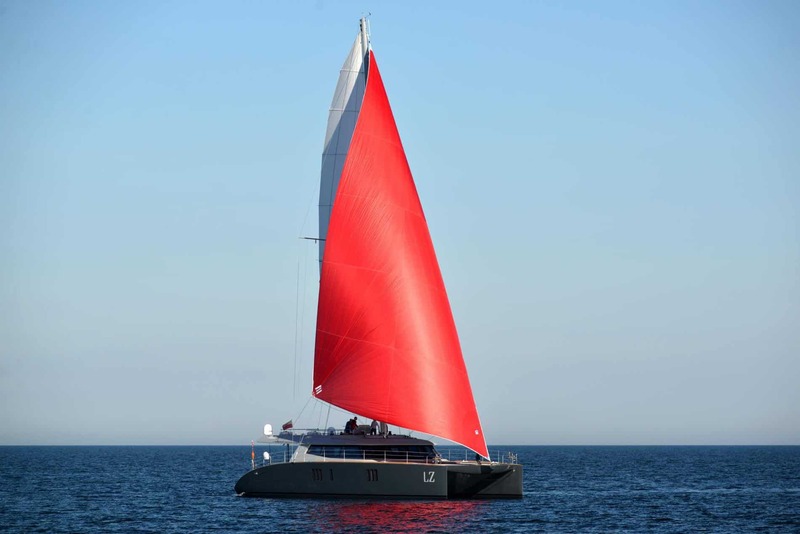 The mast has been moved to the aft as to allow the use of large head sails, providing more power and balance in reaching conditions. 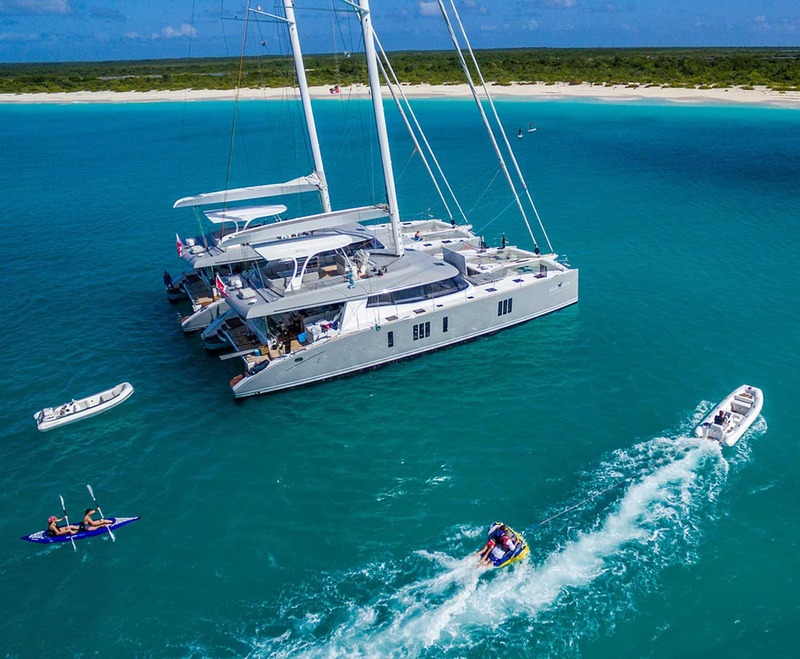 The boat’s long hulls and sporty lines increase the speed under sails and the self-tacking jib makes navigation even easier. 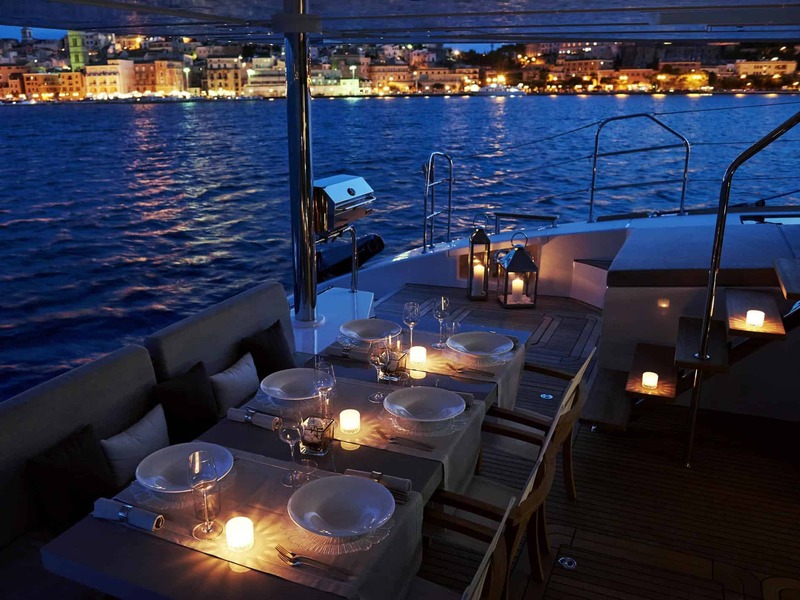 Threfore, spinning the wheel is all that is left to do, the rest is automatic. 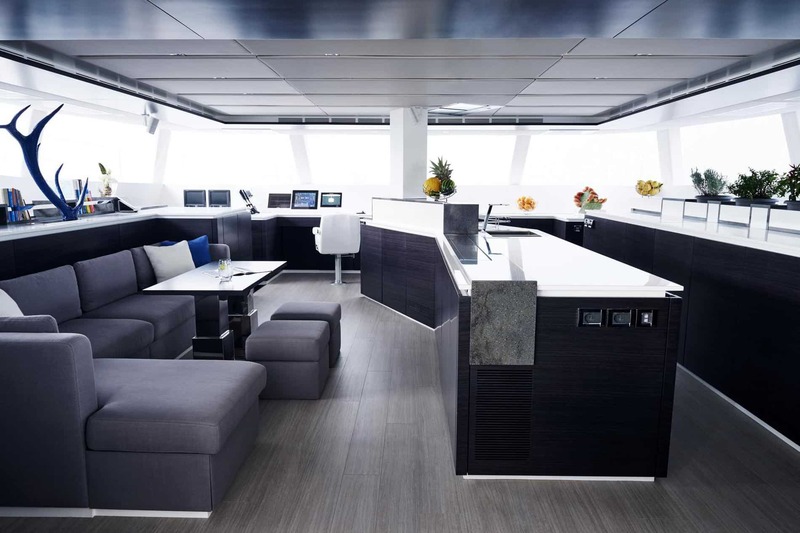 Also, the mast, boom, crossbeams and even the tender lifting arms are built in carbon. 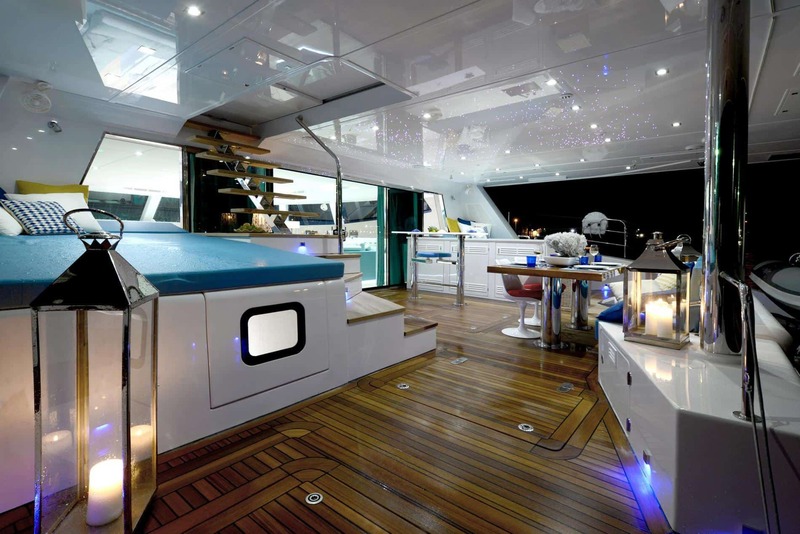 This makes the Sunreef 74 light and quick, while remaining stable. 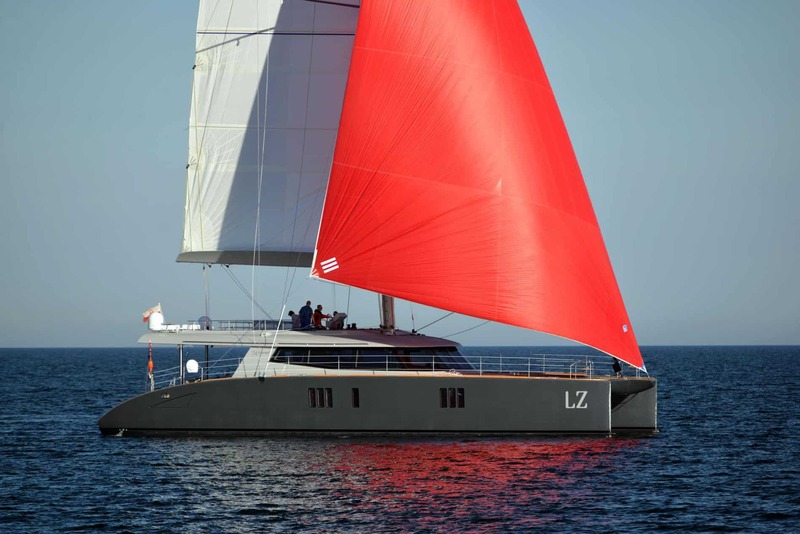 The very first unit launched will also feature a carbon furling boom which will make all manoeuvres even easier.